COLUMBUS, Ohio—Stuck in the mud, some cows across the state might not be putting on enough weight. Cattle have been getting pretty muddy as a result of Ohio’s extremely heavy rainfall in 2018 and precipitation so far this year. The mud can lead to thinner cows because it takes a lot of energy for cattle to trudge through mud and to keep their bodies warm when cold mud sticks to them, said John Grimes, beef coordinator for Ohio State University Extension. OSU Extension is the outreach arm of The Ohio State University College of Food, Agricultural, and Environmental Sciences (CFAES). Pregnant cows that don’t gain enough weight are at risk of having weak or stillborn calves and of not being able to produce enough milk for their offspring, Grimes said. The rainfall in 2018, likely the third highest amount in Ohio’s history, led to the delayed harvest of hay. Hay that’s harvested late often is higher in fiber and can be lower in nutrients for the cattle that eat it. “So, you can put more hay in front of them to eat, but if the quality isn’t good, it’s not going to help,” Grimes said. Significant shifts in temperature from, say, a high of 50 degrees to a high of 20 degrees put further stress on a cow’s body to adjust to the changes, Grimes said. A pregnant cow at the time it gives birth typically weighs 1,200 to 1,400 pounds. Much of that weight is gained in the last 30–45 days before the calf is born. The cow should be gaining 1 pound a day in the last month or so of pregnancy, Grimes said. 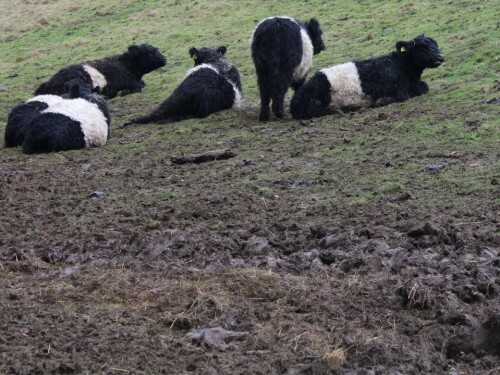 The stress of cold and mud on cows could also be a problem in their next pregnancy, Grimes said. “And if the cow doesn’t have a live, healthy calf every year, it can be tough to be profitable,” he said. Farmers and ranchers can try to fatten up their cows with supplementary feed, Grimes said. But before doing that, cattle owners should have their hay tested for nutrients to see what, if anything, is lacking in it. Even if hay has all the necessary nutrients, cows still might need a supplement because of the additional stress that the weather is putting on their bodies, Grimes said. Ideally, in summer, farmers should scrape their feedlots, smoothing out areas that could fill up with water, said Stephen Boyles, OSU Extension beef cattle specialist. They might need to build a ditch to send the water away from the feedlot, he said. The trick is finding a day when it’s not raining to make the improvements to the lot—and last summer, that was tough.